WIGeoGIS is an authorized Bing Maps reseller. Bing Maps is the worldwide map service from Microsoft and provides up-to-date geodata and visualisation of spatial information as high quality web services. As an authorized reseller, WIGeoGIS will help you to select the best licensing model for your needs. In addition, we develop your individual WebGIS solutions based on Bing Maps and offer you additional data. Bing Maps includes up-to-date maps, satellite and aerial photos of the highest quality. The service provides three-dimensional views of buildings with the so-called Bird Eye function (if available in the country) as well as routing, the flow of traffic (Traffic Flow) and an exact placement of Points of Interest (POI). Bing Maps also has a very good geocoding service with forward, reverse and batch geocoding functionality. Autosuggest feature: Suggestions for completion while entering the address and location in the search field. GeoJSON Support: GeoJSON is one of the most widely used file formats for storing and transmitting geographic data. The data can be easily imported and exported. Heat Maps: Visualization of the data point density in a heatmap (density map). Pushpin clustering: Closely related points are automatically grouped or displayed individually depending on the zoom factor. Streetside imagery: 360 degree views at street level (if available in the country). Touch Support: Easy navigation through Bing Maps via touch screen, mouse or keyboard. You can find up-to-date information and details about Bing Maps and the further development of the map service in the Microsoft Bing Maps blog. 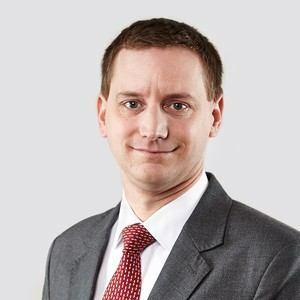 In the spring of 2018, Microsoft will be offering four new features relating to fleet management and logistics. 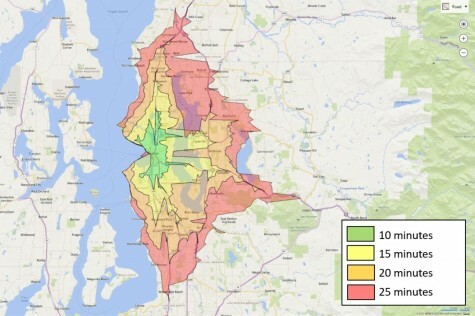 With the Isochrone API, you can calculate catchment areas by time or distance. Starting from a single point (X/Y coordinate) you can then display them as a polygon on a map making them visible at a glance. Consideration of parameters such as one-way streets etc. Typical application: You are planning a new branch location and want to calculate how many potential customers will reach you within a radius of a 500 meter walk, 10 minute walk or 10 minute drive by car. The query can be linked to demographic data such as purchasing power, etc. Calculate the shortest, fastest and safest route for your truck fleet, including parameters such as height, weight, turn radius, etc. The API is an extension of the existing routing service in the Bing Maps V8 Web Control and takes into account that your truck can not drive everywhere a car can. Typical application: You optimize the route of your fleet in terms of time, cost and safety. For example, the API suggests a longer route for a truck because the shortest route contains an underpass that is not high enough for the truck to drive under safely. 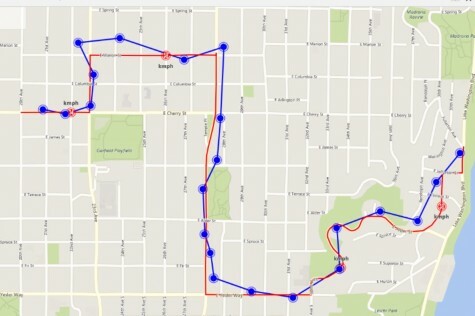 Inaccurate or missing GPS data collected along a route may sometimes result in a driving route that does not make sense. The Snap-to-Road API snaps the data to the actual geographic route (road), taking into account the time factor. Would You Like to Integrate Bing Maps in Your Software? Typical application: Your GPS data is too inaccurate and incomplete, making analysis time-consuming and ineffective. With the Snap-to-Road API, you can get useful data about the route you are driving and thus further optimize your monitoring and planning. Issues such as compliance with speed limits and other specifications can be evaluated. Calculation of distances between two points A and B. You receive a list of all possible routes complete with time and distance information. With the Distance Matrix API, you can optimize your route planning in many-to-many scenarios, thus increasing your efficiency and profitability. Typical application: You supply 14 supermarkets with goods from two bakeries. 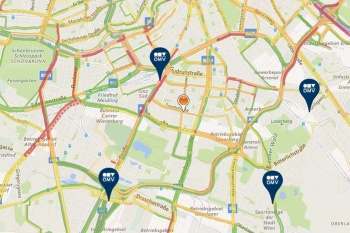 The Distance Matrix API allows you to optimize the number of vehicles required, their capacity and routes, and also plan additional possible supermarket or bakery locations. or if you need a custom application based on Bing Maps we will be happy to develop it for you. Content, features and layout can be adjusted to meet your specific needs and activities, so that the solution is also a good alternative to Map Point applications. By integrating Bing Maps into our product and service portfolio, WIGeoGIS can combine our extensive know-how in the field of geomarketing and web-based map solutions with the data and services offered by the world market leader Microsoft as well as with other market data (e.g. worldwide sociodemographics), statistics and extensions. Thus, you get the best of both companies and know your solutions are always state-of-the-art. ROUTEX Branch Finder & Route planner - A WebGIS from WIGeoGIS On the web and mobile devices. The portal supports cashless refueling on European roads. WIGeoGIS hosts the store finder software for your business. Place your business is in good hands with us as your WebGIS specialist. Direct marketing stands for as little wastage as possible, yet the demands of customers on distributors of direct-to-household advertisements are increasing. Are there different license models for Bing Maps? Depending on the application, Bing Maps offers the following license models: Per user models, transaction-based models and a Mobile Asset Management model for fleet tracking. What are the benefits of Bing Maps in comparison to other web services? Unlike other web services, when using Bing Maps it is permitted to save the geocoding results, XY coordinates, in databases and to display them on Bing Maps, which is especially interesting for B2B applications. Bing Maps offers companies a guaranteed level of service, support and license security at a low price. 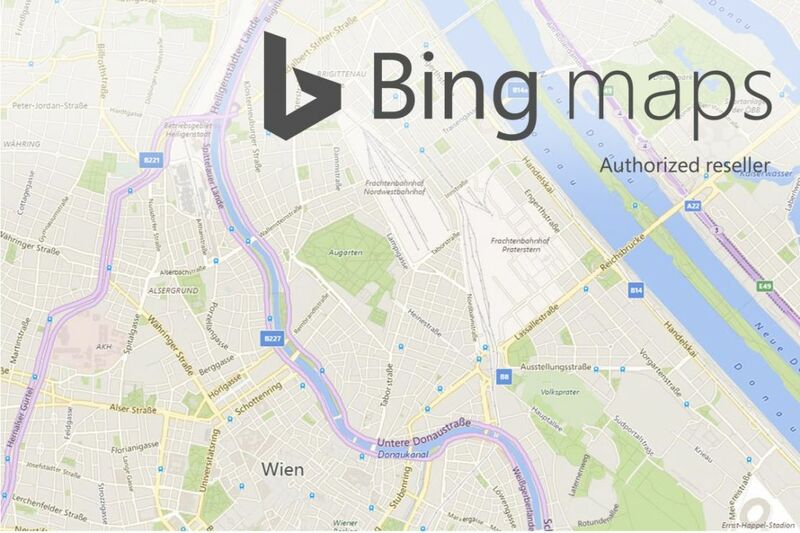 Microsoft expands, updates and supports Bing Maps regularly. Is Bing Maps available worldwide? Can Bing Maps be used offline? Bing Maps is a Web Service and is only available online. Therefore it is not possible to use Bing Maps offline. Is the map content, satellite and aerial imagery updated? The map content is constantly updated worldwide. Satellite and aerial images are updated on an average of every three years.